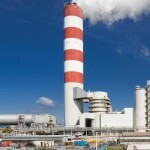 Large power station in Poland saves money, time and space by using the New Chimney Design for two new FGD wet stacks. The Patnow-Adamow-Konin power station complex in central Poland has a combined capacity of 2,457 MW. Together, the three power stations have a 10% share in total Polish electricity production. 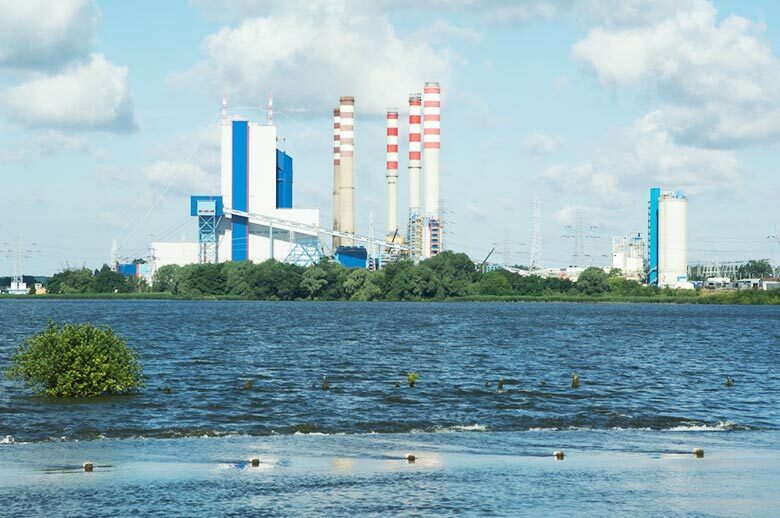 To meet new Polish and European environmental standards, four existing lignite fired units at the Patnow power station are being retrofitted with Flue Gas Desulfurization(FGD) plants. Each of these units has a 200 MW capacity. 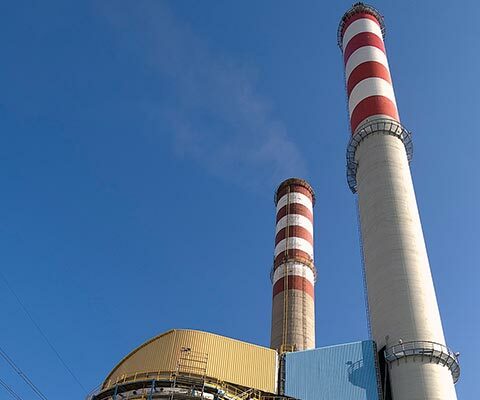 After a careful economic evaluation of all alternatives, Patnow power station ordered Rafako, a leading EPC contractor to the Polish power industry, to construct two wet limestone FGD plants, each with sufficient capacity for two of the 200 MW units. The owner also decided, that he would not reheat the desulfurized flue gas before emission. The two existing chimneys were not suitable for wet stack operation, so it was necessary to build new chimneys or as two seperate chimneys. 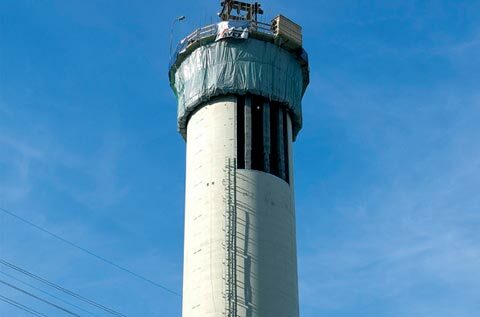 For all design alternatives, the required height was 149 m.
Rafako and specialized chimney constructor Karrena studied a number of alternatives and found, that two, PennguardTM lines concrete chimneys (New Chimney Design) would be the optimum approach for the Patnow site. 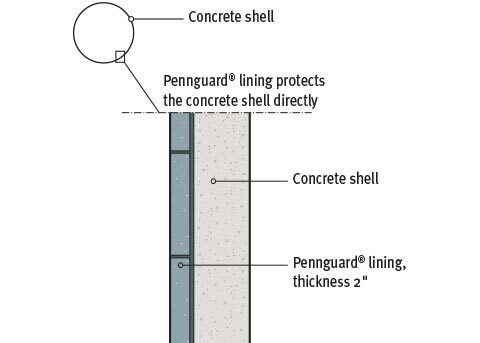 Even though two chimneys seemed more expensive than one, the cost of each chimney could be kept low, by applying the PennguardTM lining directly to a slender 8.4 m diameter concrete shell, avoiding seperate flues. Each of these chimneys could be close to its own FGD absorber, minimizing the use of expensive ductwork. The selected option of two PennguardTM lined concrete chimneys also offered some further advantages. First of all, two slender chimneys use far less space than one large diameter chimney with extensive ductwork. Furthermore, the slipforming of the two concrete shells could be done quickly, with minimal interference in the construction process of the FGD itself. 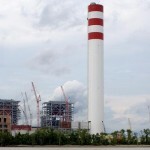 The two chimneys were constructed using continuous slipforming technology. The slipforming of each 149 m high concrete shell took 38 days. Immediately following this surface treatment, a special epoxy primer is rolled onto the concrete. 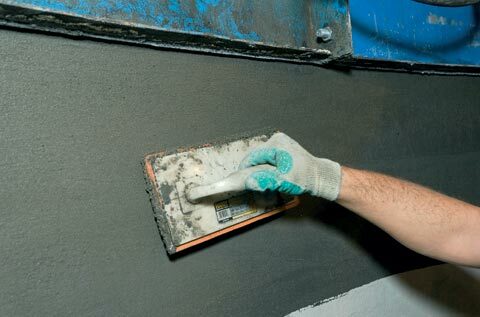 This primer will slow the evaporation of water from the curing concrete and it also offers a suitable bonding layer for the PennguardTM lining. 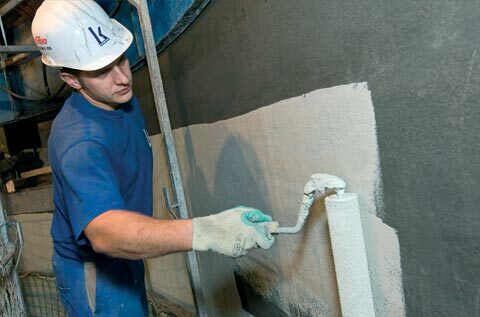 After completion of the chimney shell the PennguardTM Block Lining System is installed directly onto the primer coated concrete. The lightweight, 54 mm thick lining is installed from the flue gas inlet level up to the top. 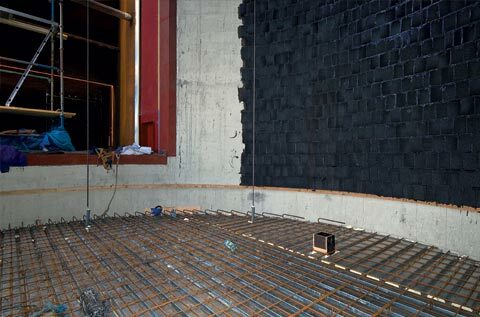 The PennguardTM installation work is performed by a team of 6-8 brick layers, using a movable work platform with a full floor and a fast lift for transportation of personnel and materials. Good lighting of the work area is essential. 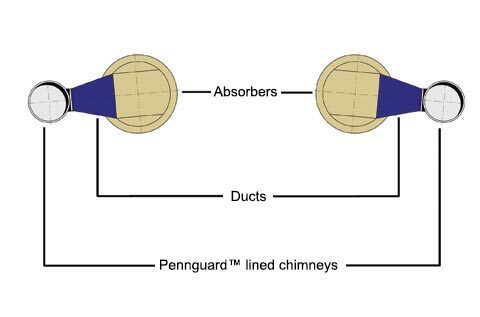 When the major installation work of the PennguardTM lining has been completed, the chimney is equipped with a false floor, placed just below the flue gas entry level. When completed, this floor will also be protected using a PennguardTM lining and an additional layer of TufchemTM silicate concrete. was based on several considerations. 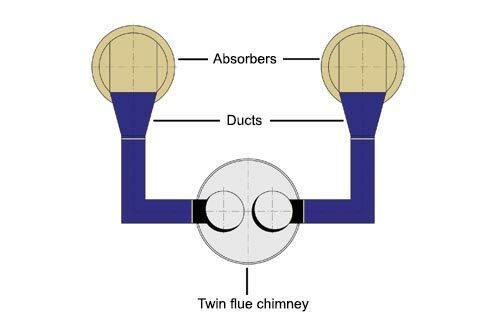 The use of two slender chimneys and short FGD outlet ducts, rather than a twin flue chimney and much longer ducts, saves a lot of space on the site. Shortening the flue gas ducts also minimizes pressure losses and thereby reduces required fan power. The short construction time of each chimney is a welcome advantage when planning a complex FGD construction job. With all of these advantages, the two concrete PennguardTM lined chimneys cost less, not more than a single twin flue chimney. The total amount of concrete used for two chimneys was 2,640 m³. A single twin flue chimney would have required 3,250 m³ of concrete. It would also have required two internal flues with a combined surface area of 6,014 m². Looking at the chimneys alone, using two concrete PennguardTM lined chimneys, instead of a single twin flue chimney, offered an estimated savings of 10 % on total chimney construction cost. 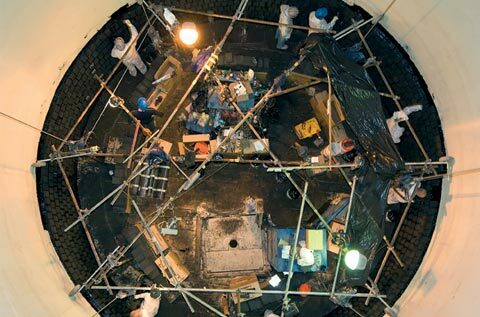 On top of this, an estimated 50 m length of ductwork was also eliminated.